On May 15, 2017, for the third year in a row, the Department of Fire Protection Engineering (FPE) at the University of Maryland presented its annual Design Challenge this year hosted by the U.S. Bureau of Alcohol, Tobacco, Firearms (ATF) and Explosives Fire Research Laboratory. A fact that many people are unaware of is that in addition to alcohol, tobacco and firearms, the organization also offers forensic expertise in bomb and arson investigations, making the ATF Fire Research Laboratory (FRL) an ideal place to hold a 'burn' event. In a lab unlike any other in the world, five high school teams from various parts of Maryland – DeMatha, Mount St. Joseph’s, Mount de Sales, Elizabeth Seton and Maryvale Prep – gathered in Beltsville to test their skills at fire protection engineering. 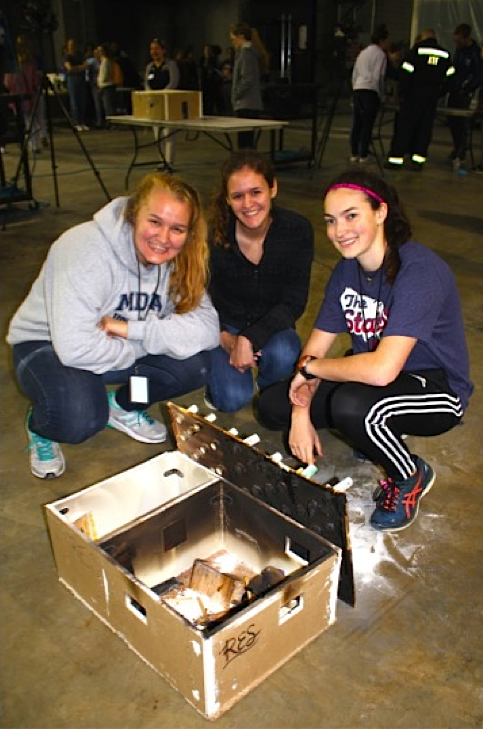 Roughly 30 teams from the schools competed against each other to build miniature model homes, adorned with innovative detection and suppression systems, which were set ablaze. Six UMD judges recorded the time it took for each model system to 1) detect the fire, and 2) put the fire out. Detection methods ranged from water balloons, to Pop Rocks, to battery-powered alarms, and one group from Mount de Sales creatively utilized melted chocolate as a means of initiating suppression. Prior to the event, the students attended a series of short lectures, taught not only by their teachers, but by volunteer FPE graduate students, faculty and alumni, too. Mentoring by FPE affiliates was also available to the students throughout the spring semester. Upon arrival at the lab, fire protection engineer Adam St. John, an FPE alumnus, offered students a tour and insight into the work of the ATF forensics team. St. John explained that the lab investigates arson cases from all over the world, but primarily at the local and national level. ATF forensic analysts rebuild arson scenes and then burn them down, sometime multiple times to analyze variables (e.g. point of ignition, fuel source, room ventilation), to help determine the origin and cause of the fire. Each ‘burn’ is video-recorded and shown to juries in criminal cases. In fact, because of the extensive testing that the ATF scientists conduct and document, most criminal cases are settled before trial. After the tour, the student teams took turns explaining their model/detection and suppression method. An ATF employee then set the models aflame and UMD undergraduate and graduate assistants kept track of the time it took for each method to activate. Although a few of the students had participated in similar school assignments, most had never been involved with such a dynamic project. James Milke, Chair of the Department of Fire Protection Engineering at UMD, was impressed with the variety of unique and creative detection and suppression systems. "Some of the designs were relatively sophisticated and included an autonomous means of initiating suppression activities following detection," he said. "The creative skills to develop innovative fire protection solutions are utilized by many practicing fire protection engineers." Dr. Milke told the students that he hoped that this project would motivate these students to consider studying fire protection engineering at the University of Maryland! The cost of the program is funded by each school. For additional information, or to inquire about next year’s event, please contact Nicole Hollywood (nlholly@umd.edu).